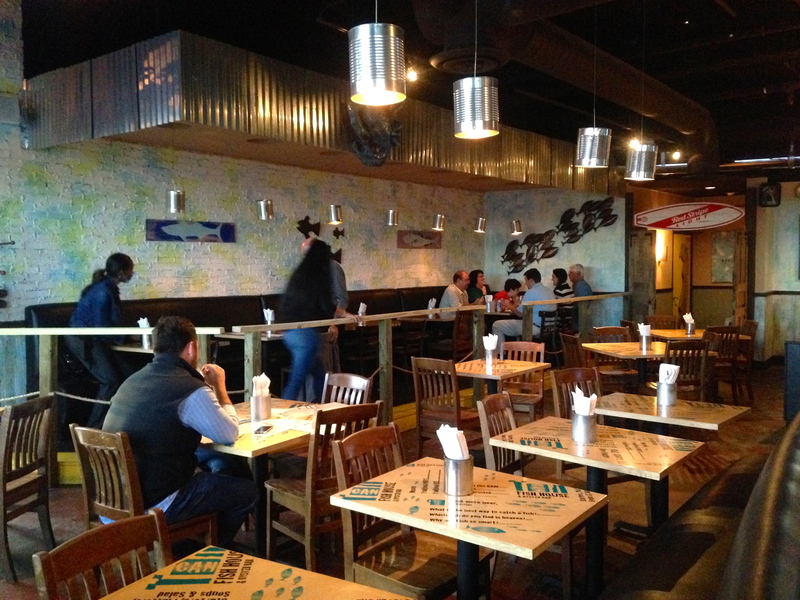 Date Night gets invited to “kick the can” and to sample some of the items on the Tin Can menu. 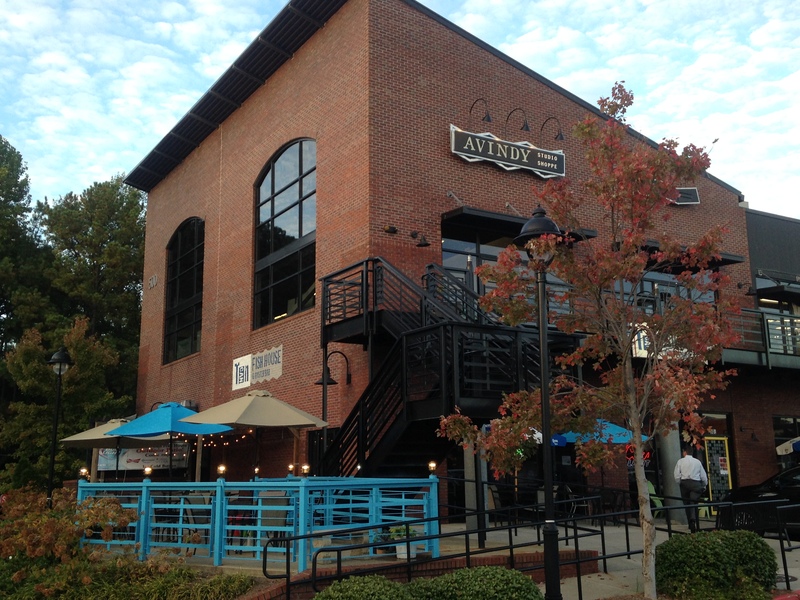 We are in Sandy Springs tonight, right next to Teela Taqueria, which we enjoyed when we visited. It won’t surprise you that the restaurants are owned by the same people. Let’s step inside and have a look around. As the name suggests, the decor is pure fish house. Lots of aluminum roofing, old license plates and beer signs. We have some old plates in the basement we could donate. It’s like a fish-themed man cave. You have to drink beer with oysters and we plunge right in. 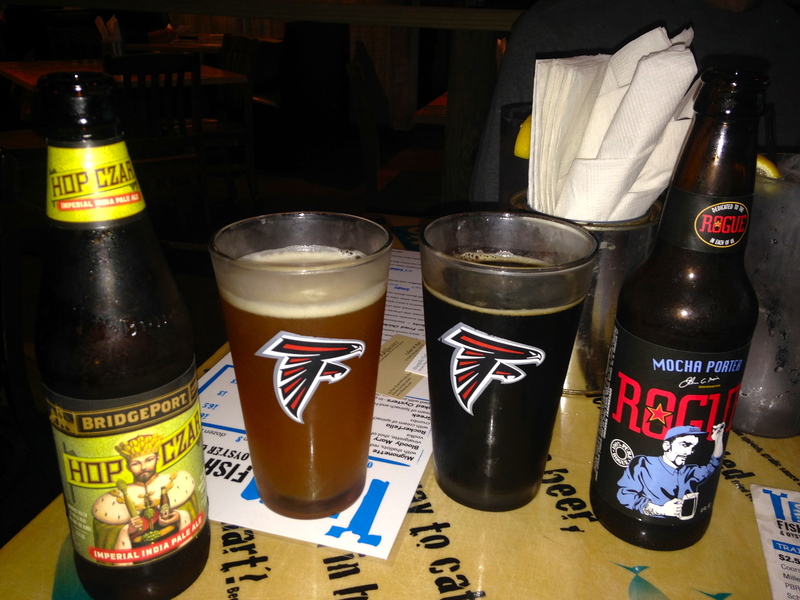 I like hoppy beer with my seafood and I go all-in with the hops. The Bridgeport Hop Czar lives up to its billing. With an IBU of 87, you get that bitter finish that hoppy beer is known for. Eve goes for the Rogue Mocha Porter. It has a strong coffee taste and Eve enjoys it. 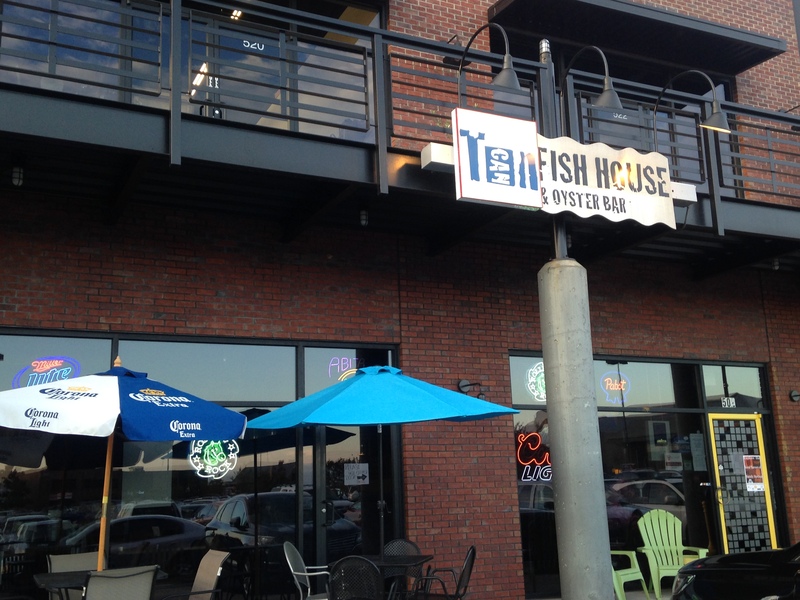 Here’s a great deal to start off–ten oysters for ten dollars. You can’t beat the price, except on Monday nights when Tin Can has oysters for $6 a dozen. We don’t know of a better deal on oysters in Atlanta. There are five different oysters on the plate. You can mix and match or get two of each like we do. 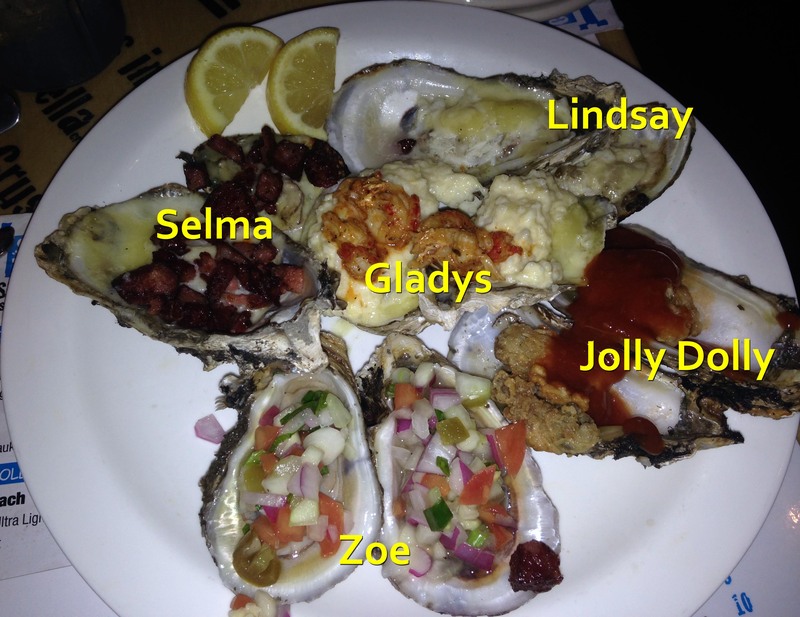 Milla Williams from Happily Eating is at the next table and her oysters are labeled. Ours are not, but we labeled them for you so you can see what we are talking about. Diners rank their favorite oysters. The top three vote-getters in October will be included on future Tin Can menus. We’ll start our voting at the bottom and work our way up. Coming in last is the Lindsay, baked with parmesan cheese and topped with crab meat. We don’t detect much oyster in there and in Milla’s words, it “tastes like the broiler.” Number four is the Selma, parmesan cheese with chorizo sausage. The sausage overwhelms the delicate oyster. In third place, we select the Zoe, which is the only raw oyster on the plate. They mix in diced tomatoes, cucumber and a bit of jalapeño to make this a spicy treat. Our runner-up is the Gladys, which is topped with cheese grits and crawfish tails. It’s a creative twist to a baked oyster. We pick the Jolly Dolly as our winner. It’s a fried oyster topped with spicy cocktail sauce. You can never go wrong with fried oysters. On the back of the oyster menu is the lobster menu. Restaurant owner Nik Panagopoulos encourages us to try the lobster bisque, but alas, there will be no bisque tonight because Tin Can is entirely out of lobster. Anyway, we hear it’s good. Here’s a delicious substitute for bisque, the seafood stew. This is a cup. You could make an excellent meal out of a bowl. 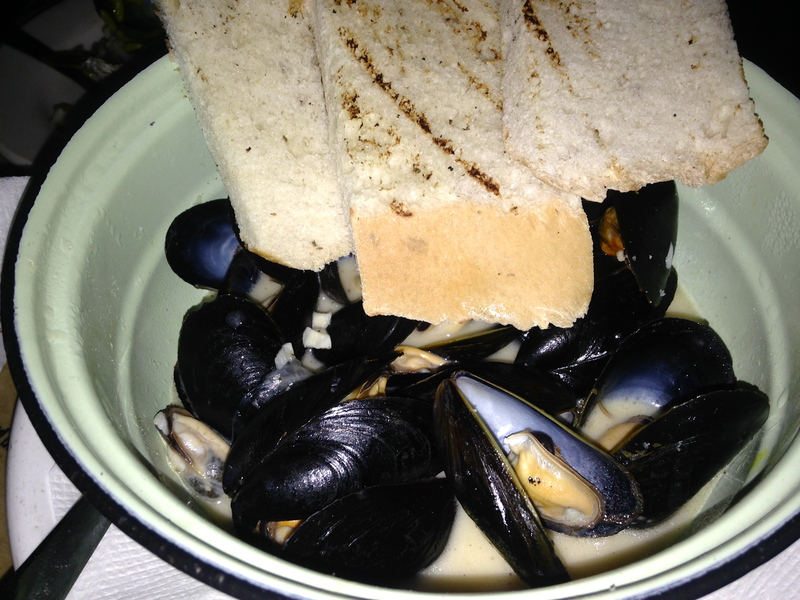 It’s a bouillabaisse stuffed with fish, mussels, calamari, and shrimp. This is a fabulous dish and we don’t miss that lobster bisque at all. 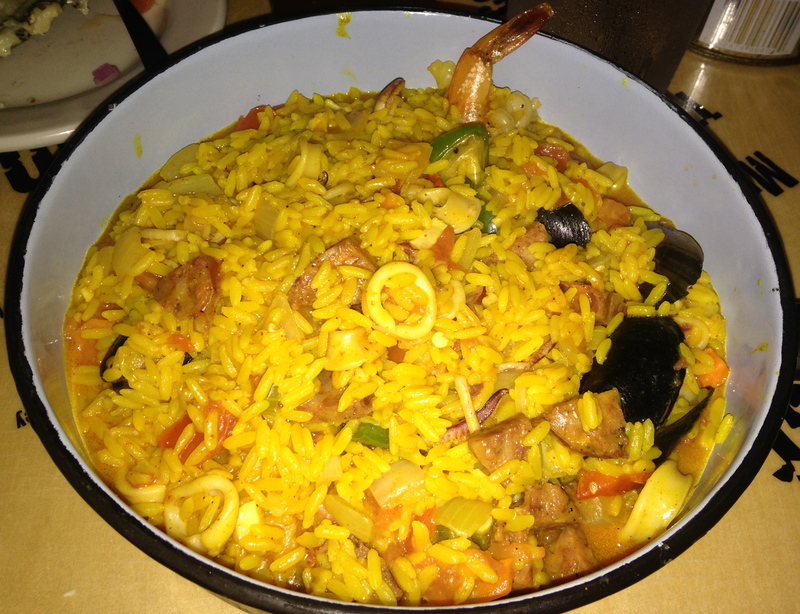 Along with our stew, we share the delicious paella, a spicy concoction due to the andouille sausage. 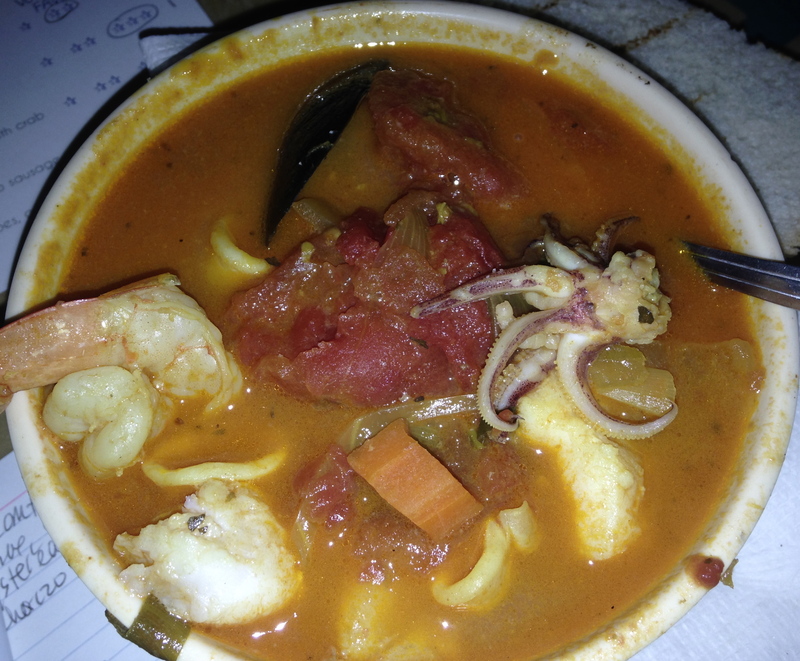 There’s calamari, shrimp and mussels in there too, making this the Spanish version of the seafood stew. Milla is nice enough to let us take pictures of her food. A nice touch at Tin Can is that you can order one of seven different kinds of fish and have it made five different ways. The combinations are endless. You will have to read her blog post to find out how she liked her meal. Back at our table, we decide to order something from the fryer since there is a lot of fried food on the menu. You can order one or two soft shell crabs on a plate. We should have ordered none. The crab is fishy, chewy and salty. It’s not very good. As fresh as Milla’s fish looks, this tastes frozen and rubbery. Something tells us crabs are not in season right now. 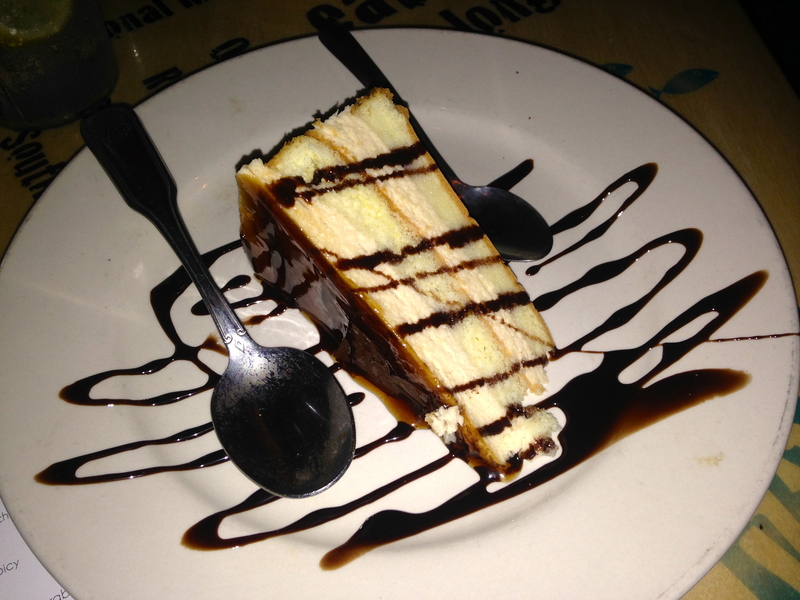 Since we shared everything, we have a bit of room for dessert. The tres leches cake must be inspired from the taqueria next door. It’s light and fluffy and a nice way to end a seafood meal. The verdict: Fun. 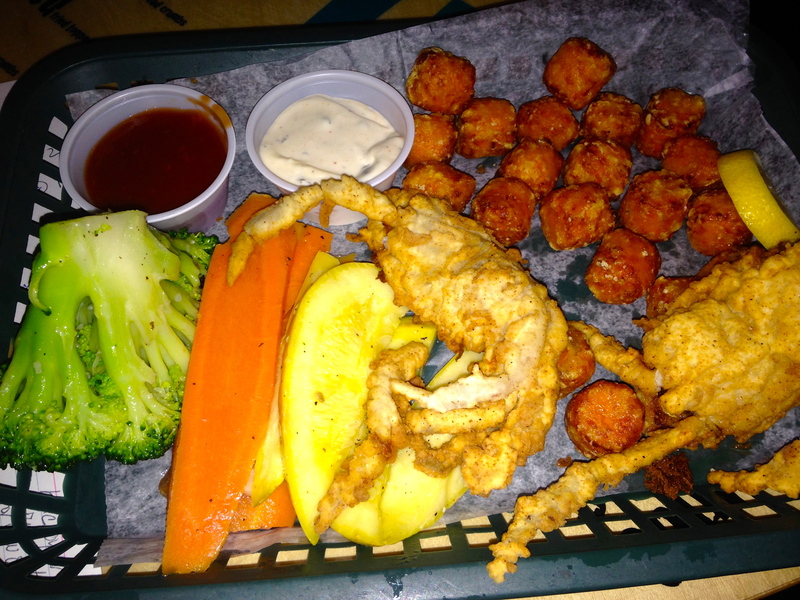 We had an enjoyable meal at Tin Can, but avoid those soft shell crabs. 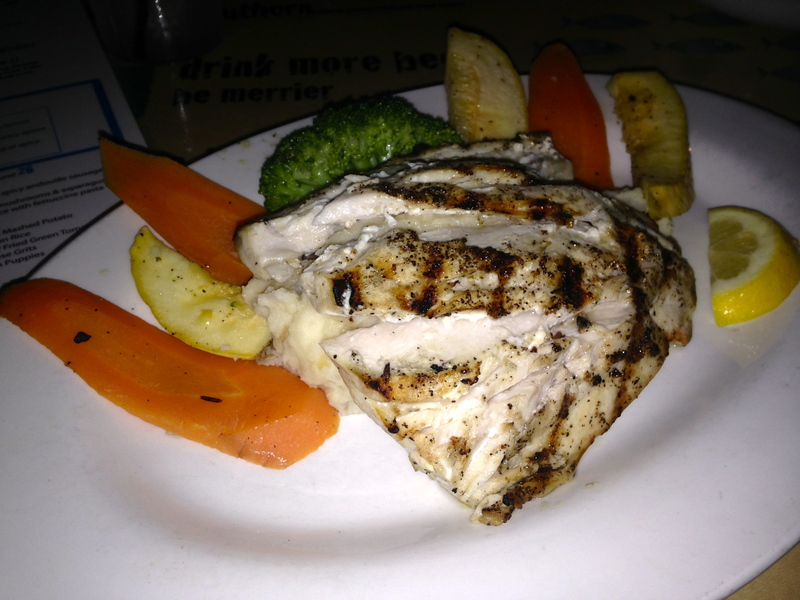 Stick to the fresh fish menu and you will get a gorgeous hunk of seafood cooked any way you like it. Order those oysters as they are a deal at $10. It will be interesting to see which oysters got the most votes in October. 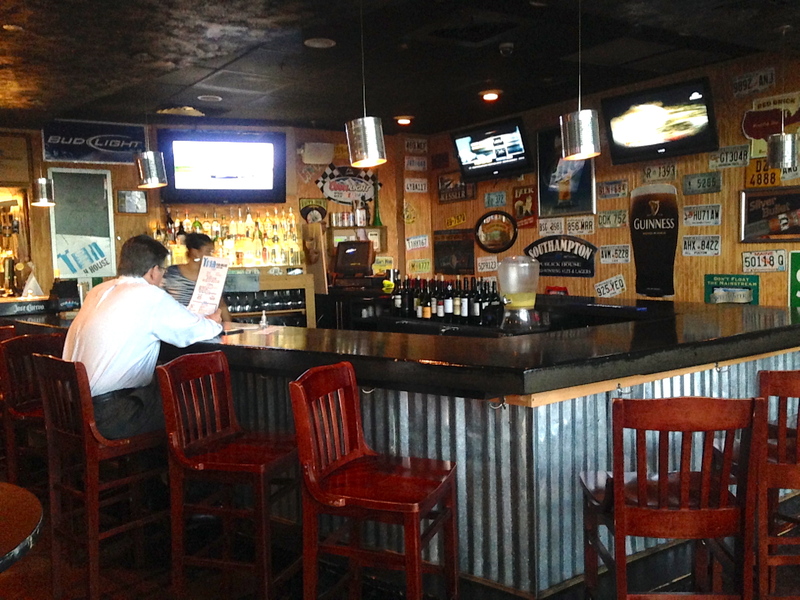 Disclosure time: We paid for our beers at Tin Can, but did not pay for the menu items. Our opinions, however, are priceless and are not affected by the complimentary food. Thanks to Lilian and Candace at the Lilian Raji Agency for inviting us to this event at Tin Can.